Veterans Day is November 11, and Legends of America salutes all those who have served this great nation. Your sacrifice and service are second to none! New York Times, page 1, November 11, 1918. It was “the war to end all wars.” Or at least that’s how World War I was viewed in November of 1918 when it was known simply as “The Great War”. And it was on the eleventh hour.. of the eleventh day.. of the eleventh month in 1918 that fighting ended on the western front of the war through an armistice; A day which would eventually be remembered and recognized in the U.S. as Veterans Day. 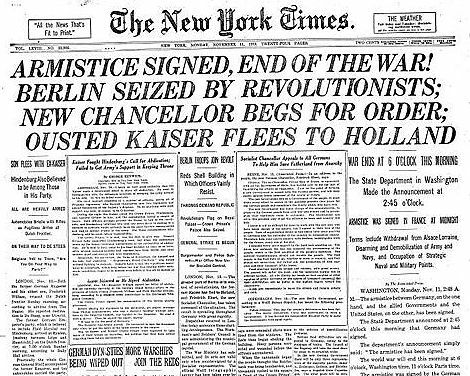 The armistice, or truce, between Allies and Germany, marked the end, on the western front at least, of a global conflict that began four years earlier and would claim millions of lives as it spread throughout Europe. In late September of 1918, Germany was facing a hopeless military situation and was forced to respond to U.S. President Woodrow Wilson’s “Fourteen Points” from earlier in January. The actual terms of Wilson’s policies were primarily written by French Marshal Ferdinand Foch, and included a call for the halt in fighting, removal of German troops to within their own borders, exchange of prisoners, promise of reparations, and the preservation of infrastructure among the terms. Although the armistice ended the fighting, it would be over six months before negotiations were complete on the Treaty of Versailles, which officially ended the war in June of 1919, and in the meantime, battles would continue in parts of the Russian Empire on the eastern front. It would not be until 1938 that Congress would approve an Act making November 11 “Armistice Day”, an official legal holiday. 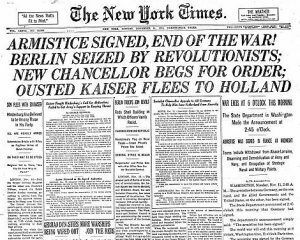 Honoring veterans of “The Great War” and dedicated to the cause of world peace, Armistice Day would continue until 1954, when at the urging of Congress and veterans organizations, the Act was amended to remove the word Armistice and replace it with “Veterans”. 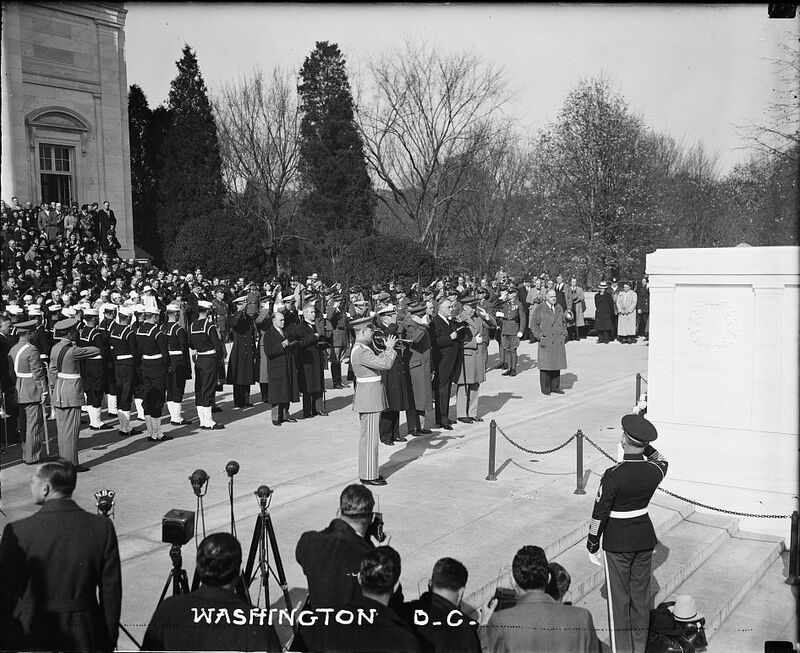 The amended Act was officially approved on June 1, 1954 making November 11 a day to honor American veterans of all wars. The official Veterans Day observance continued to be recognized on November 11 until in 1968 the Uniform Holiday Bill made changes to ensure a three day holiday weekend for Federal employees. But Congress managed to confuse the public with this move and many states continued to observe as they had. When Veterans Day was federally observed on October 25, 1971, it was met with much confusion and ultimately led to a return to the November 11 observance beginning in 1978. In doing so, Congress ensured that the historical significance of Veterans Day was preserved, along with the importance of the holiday in focusing attention on American Veterans for their tremendous sacrifices for our nation and our freedom. Veterans Day observance in the United States is different from that of November 11 observances in Europe, which continue to commemorate those who died in war. 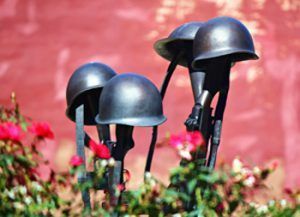 In the U.S. the date is a celebration of all Veterans, living or dead, regardless of conflict, and Memorial Day in May is instead used as a national remembrance of those Americans who have died in war. © Dave Alexander, updated November 2015. Source: United States Department of Veterans Affairs. Memorial in Guthrie, Oklahoma remembers veterans of several wars where Americans have fought and died. Photo by David Fisk.